I took a road trip to Death Valley a few years ago. 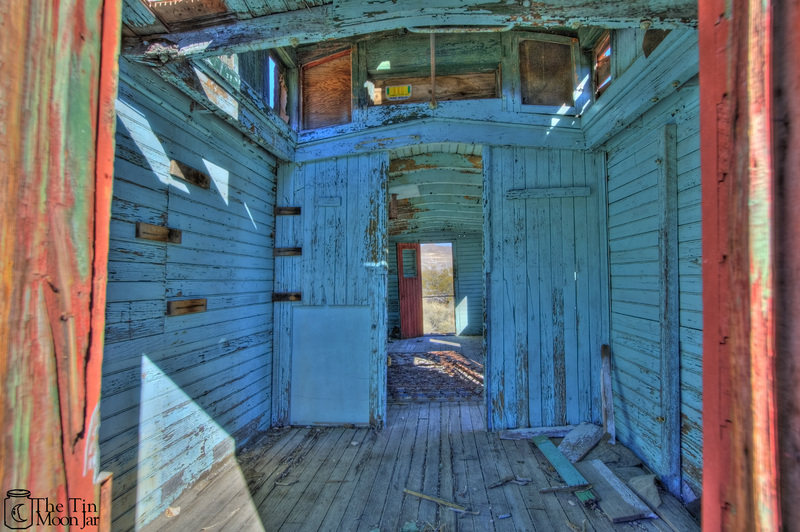 While exploring a few of the nearby ghost towns, I discovered this abandoned boxcar. HDR photography brought out the still brilliant blues and reds and hints of green and yellow, as well as the high desert landscape seen through the far opening. How fantastic this boxcar must have looked freshly painted. I wonder what it was used for—a circus? A ladies dining car? A traveling snake oil salesman’s display car? Why is there an old mattress spring on the floor? Was this a sleeping car? Magical shot, Jamie. I think somebody must have lived here for a time – I wonder who, and when? Thanks for sharing this. For some reason I hadn’t thought of that, but of course it makes perfect sense. Someone must have lived here for a time. There were a few other fully enclosed abandoned buildings in the town, but maybe the boxcar was the most beautiful choice for a residence or campout (love nest??). This place was far, far away from electricity–imagine waking up to those colors and views after a starry night!